The Council was granted a new official Coat of Arms in 1990, designed by the York Herald of Arms and approved by Warrant of the Earl Marshall, the Sovereign’s Lieutenant in matters armorial. The Coat of Arms is for the District, and replaces the one of the former City of Wakefield Council, which the Authority had used up to that time since the re-organisation of local government in 1974. It is used in connection with civic matters and is on the Mayoral Chains of Office. The Shield consists of many divisions, which fit closely together to make a unified design. The black diamonds allude to coal as a dominant factor in addition to which there are many other activities symbolised by the gold coloured divisions and also representing the wealth, both moral and material, of the area. Against this background, mural crowns signify that Wakefield is the centre of public administration for the whole area. The castellation of the crowns may also allude to the many well-known castles in the District. 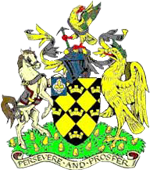 The historic '‘Fleur-de-lys’ arms of the former City of Wakefield are included on the shield. The Crest shows an eagle which is reguardant, i.e. on the alert, with a chain around its body relating to the engineering aspect of the area, and holding a miner’s axe. The undersides of the wings are lozengy Or and Vert in reference to the wealth produced by new ideas and experiment in many fields of endeavour. The Crest stands upon and forms the top of, one of the earliest forms of Helm representing Local Government Authorities. The Supporters comprise to the dexter (viewer’s left) a dray horse with pack saddle and harness alluding not only to the country areas, but also historically to its excellent means of communication; and to the sinister (viewer’s right) a golden eagle in reference to the Roman aspects of the area, especially Castleford. Beneath the Supporters is a compartment consisting of a grassy mount of field (as a pun on Wakefield) upon which thirteen golden acorns represent the thirteen areas brought together to form the new District. At the foot of the Coat of Arms is a scroll incorporating the motto "Persevere and Prosper".